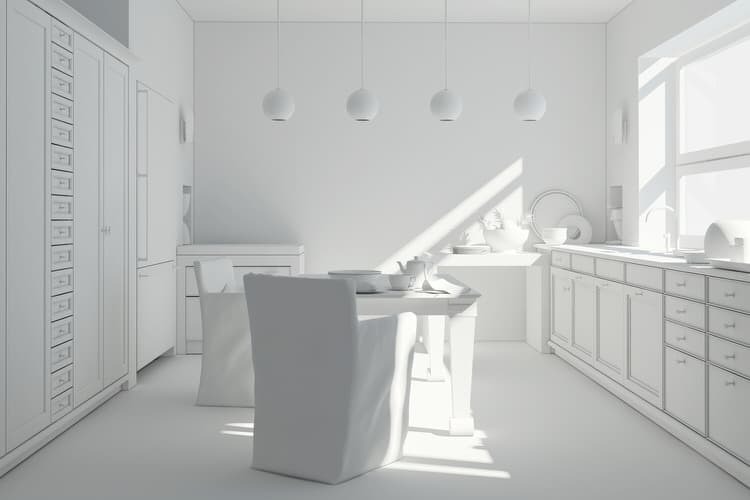 Whether you’re going for the look a crisp country kitchen or pristine modern space, using white in big doses makes a huge design statement you won’t regret. White gives your kitchen the illusion of space and gives you carte blanche to treat the room like your personal blank canvas. White allows you to bring in another color without fear of it clashing. 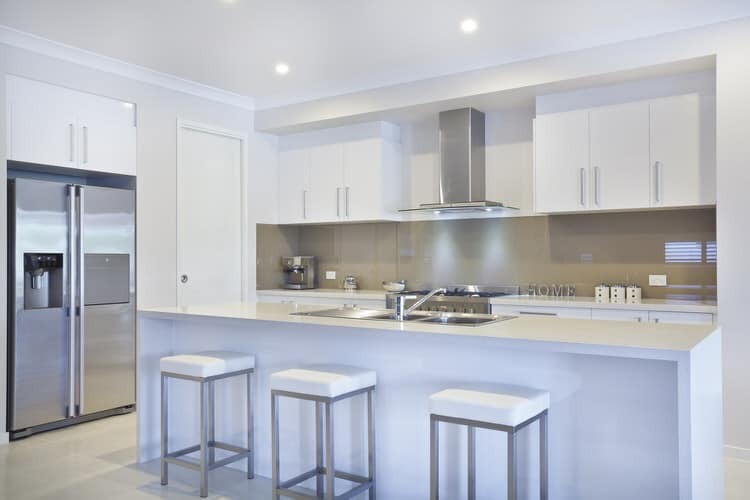 Large expanses of white make contrasting flooring, ceilings and appliances really pop. White gives you the latitude to easily change out area rugs, dinnerware and accessories with the seasons or on a whim. White kitchens are all that and more. 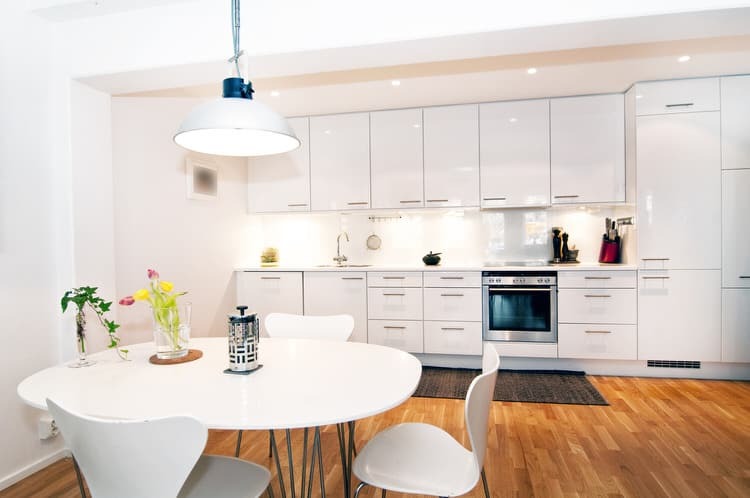 White on white on white makes for a marvelously clean and simple kitchen space. The metal and woven counter stools are the only real texture the room needs. The other surfaces are cool, smooth, sleek and understated. 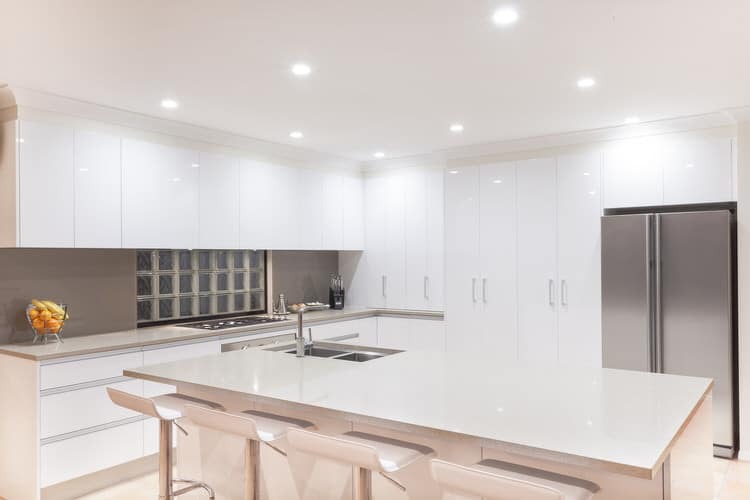 An all white kitchen is not generally recommended for families with small children and pets, however if it’s just the two of you, take this look and run with it! 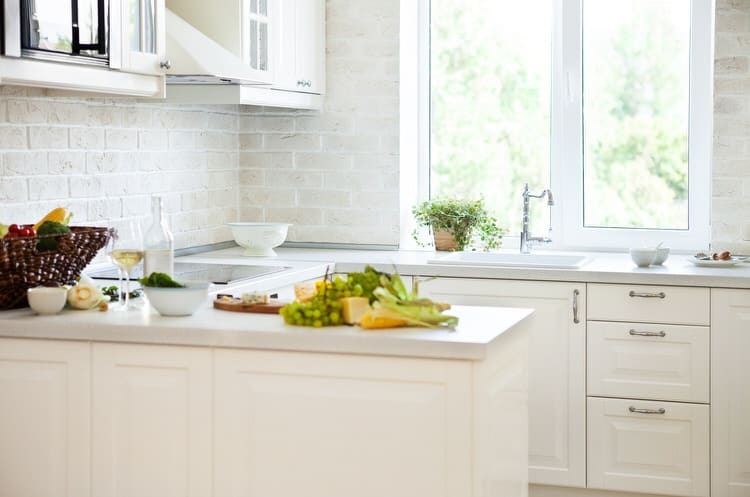 Add visual interest wherever you can in a white/bright kitchen. 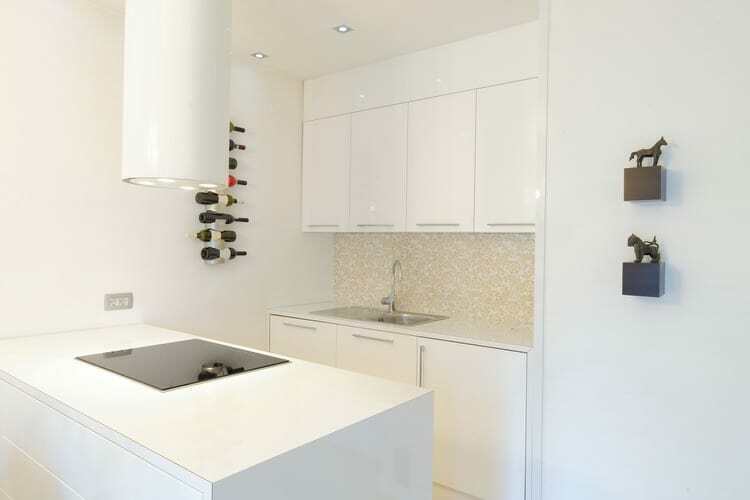 Installing wall-mounted utensil racks is an easy way to break up monotonous expanses of white wall. Toss out your old, worn out utensils and show off new stainless steel beauties. Sneak in subtle color with a colorful countertop appliance or utensils with bright rubber grips. This lovely white kitchen rocks with dark plank flooring, a white tile backsplash and three custom globe pendants. To add to the perfection, the windows have matching dark frames and sills. The island has a raised panel to conceal kitchen messes from the view of dining guests. 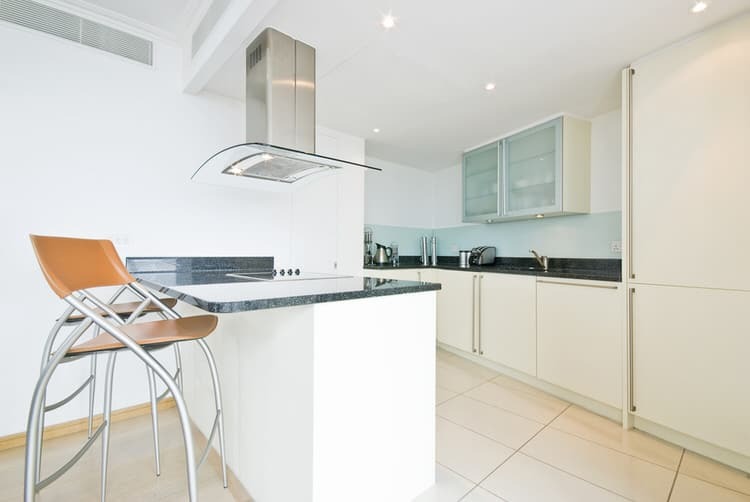 The only items visible in this white kitchen are the stainless coffee maker, the built-in oven and extremely cool stools. This is the ultimate in minimal design. We dig the look and the white maple flooring, but would love to see pendant lights over the breakfast bar and artwork on the adjacent wall. If you long for storage space, this white option is just for you! 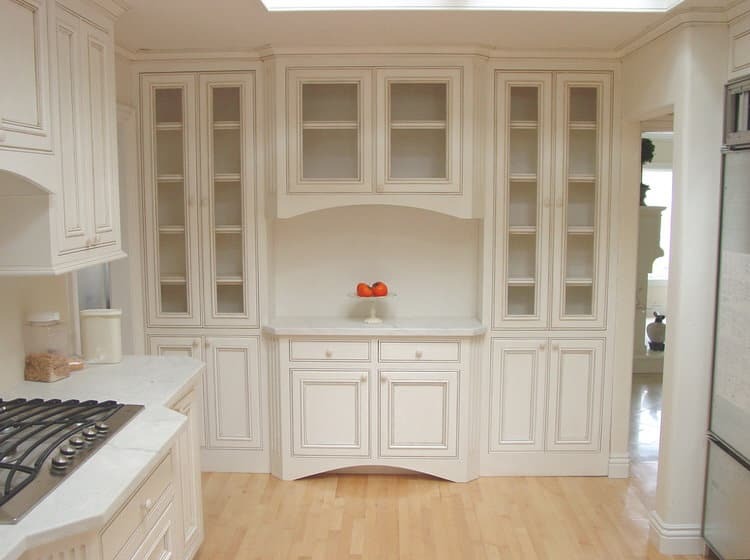 Floor to ceiling pantry units flank the inset refrigerator. You also have plenty of drawer space in the island and below the upper cabinets. Light gray tile and glass block (yes it’s making a comeback!) are unexpected touches in this streamlined kitchen. Focusing on function and form, this traditional kitchen was designed with a busy family in mind. White upper and lower cabinets brighten the space and the dark stain on the island breaks things up. Pecan flooring will stand up to years of abuse and stainless appliances and industrial pendants add a touch of contemporary to the space. What’s the first thing you notice in this petite white kitchen? Maybe it’s the amazing light fixture/hood vent above the induction cooktop. For us, it is the pair of dog figurines on the wall. All it takes is one or two eye-catching elements in a white kitchen to make it relatable. Oh, and the wine rack is a keeper too! 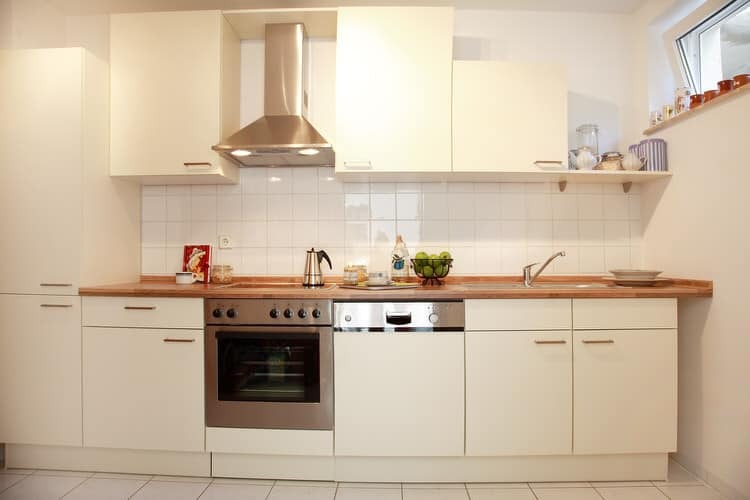 Sometimes a kitchen is situated in a pass-through from one room to another. In this case, the dining area is in the forefront and the living space is just beyond. 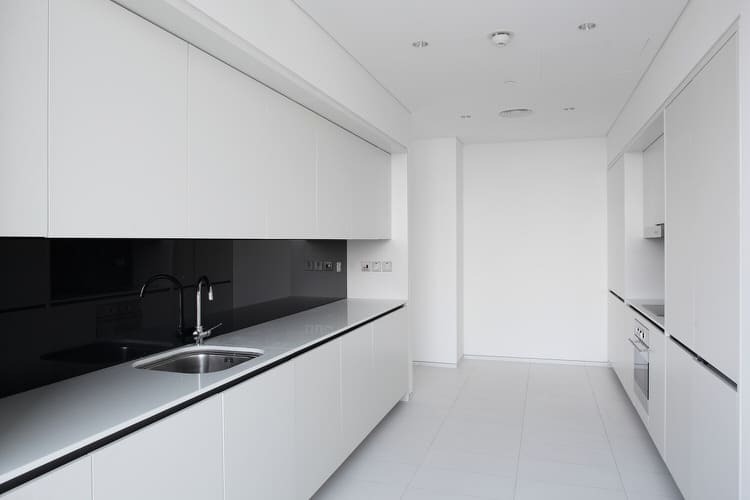 This white kitchen is designed blend in to its surroundings and be invisible to passersby. Nothing is designed to be conspicuous, with the exception of the gorgeous marble tile floor punctuated with black granite insets. Teak counters are an organic element in this metal and glass symphony of white. 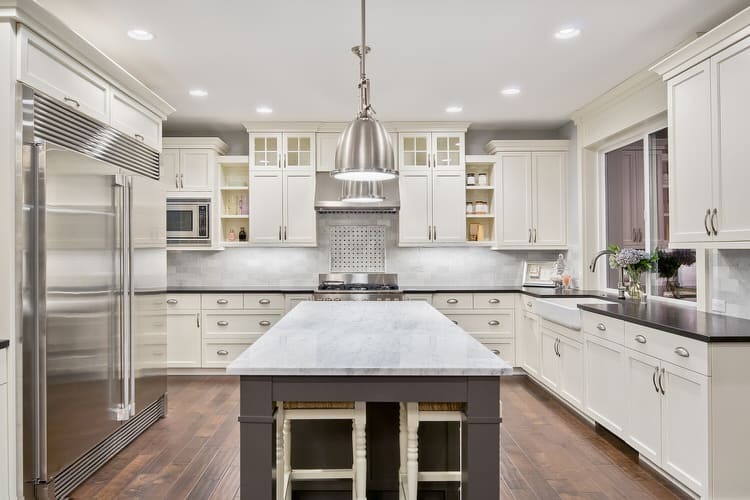 Powder-coated steel cabinets, stainless built-in appliances and a tempered glass hood vent could be seen as sterile, but the wood tone countertops and rich tile flooring warms up the cold, hard surfaces. 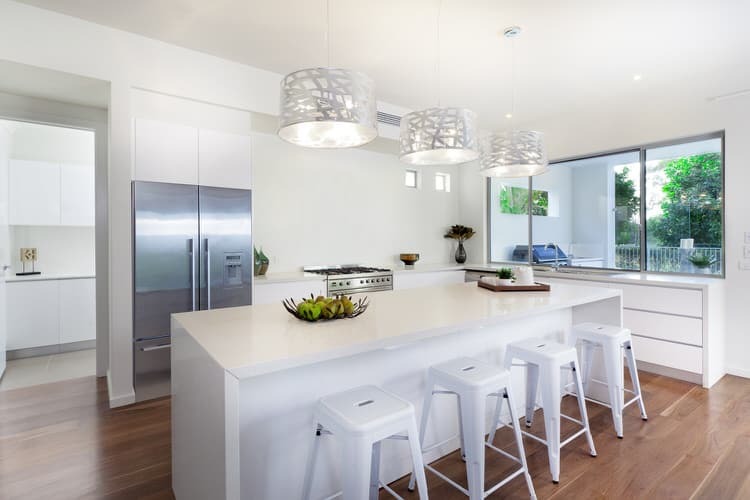 Funky cutout drum pendants and enamel bar stools are the types of fun accessories that breathe life into a plain white kitchen. The oversized window above the sink lets in plenty of light, adding to the cheerful ambience of the space. High-gloss laminate cabinets clash (in a good way) with a painted stone wall. The deep mahogany floors and ceiling dilute the white and ground the space, giving this modern kitchen a classic feel. A dark backsplash rounds out a superb design. An around-the-corner kitchen storage space hides all the serving pieces, special occasion dinnerware and grandma’s good silver. The anachronism of a butler’s pantry proves that good design ideas of the past are good design ideas today and in the future. 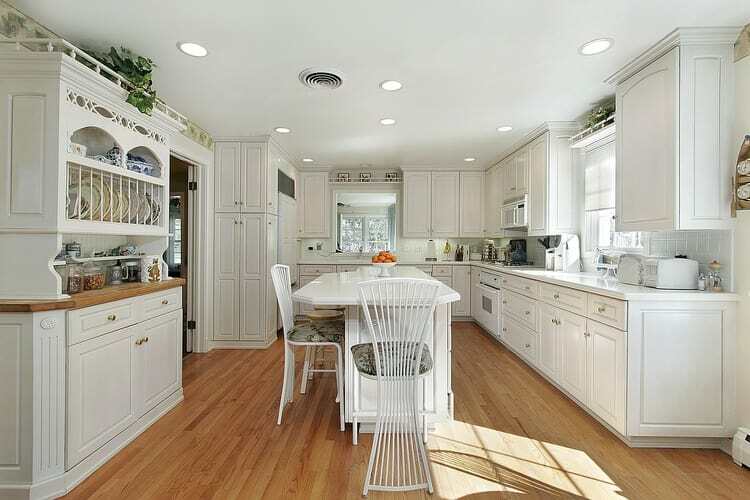 Symmetry gives this white kitchen a soothing feel and classic good looks. The cooktop is centered on the back counter and matching upper cabinets flank the contemporary stainless vent hood. The island is exactly the same length and the back countertop. The only feature that throws things out of balance is the trio of square upholstered bar stools. We think an even number would have been a better choice. 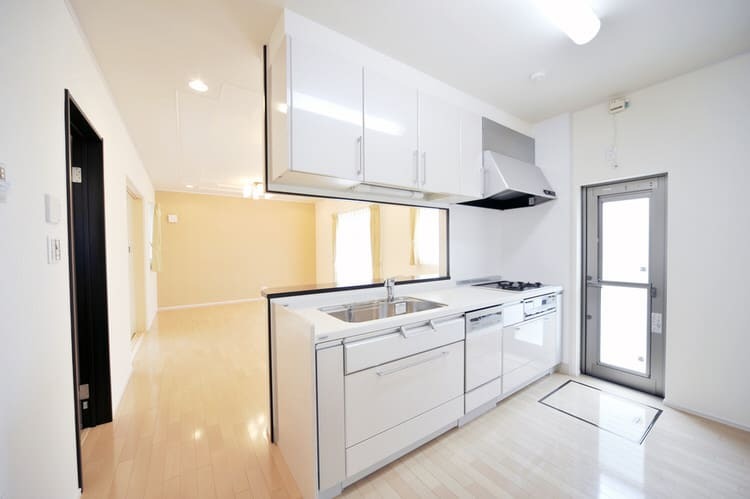 We have found a white kitchen that’s big enough to service a very, very large household. The white cabinets go on for days and feature glass fronts to show off your favorite dinnerware or collectible pieces. In the center of the ceiling is a cherry wood and metal pot rack that coordinates nicely with the flooring and end island countertop. 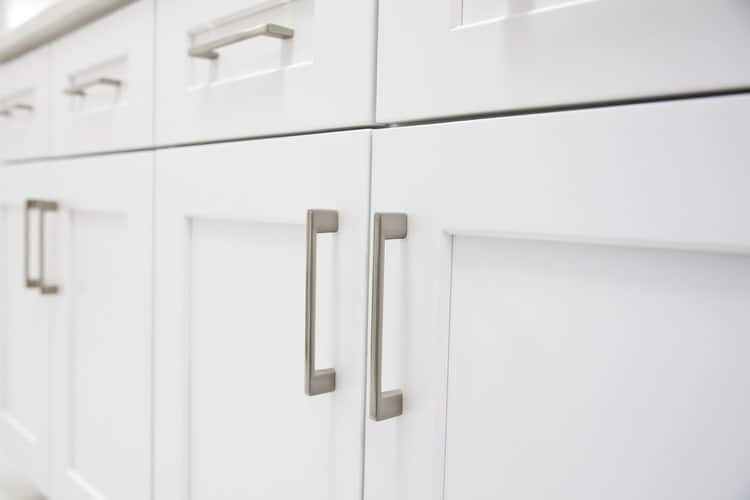 Here’s a tip to spice up your white cabinetry: add character and pizzazz to a kitchen by installing contrasting knobs, pulls and handles to your cabinet fronts. While some cabinets don’t require hardware, it’s still a super easy way to up the bling factor and break up long runs of white boxes. You can even save money and install them yourself. This white kitchen oozes country charm and we absolutely adore it! 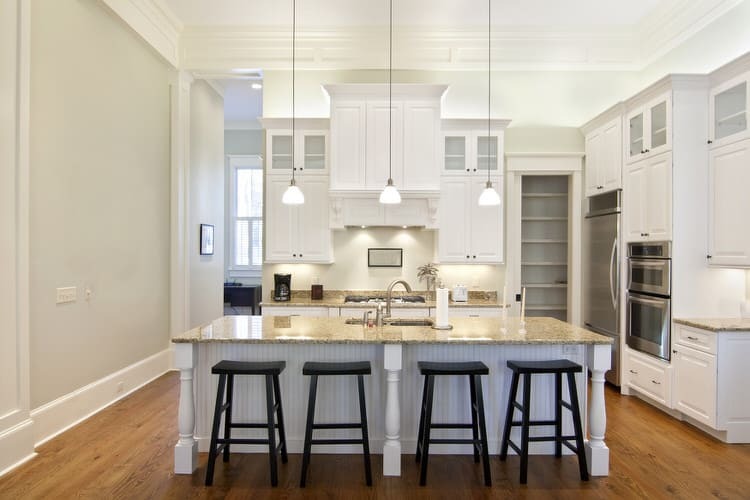 Bring the farmhouse look into your kitchen by taking cues from this room, such as turned legs on the island, a beadboard range hood and island surround, glass front cabinets, crown molding and traditional style pendant lighting. Taupe paint above the white cabinets, dark accent tiles dotting the backsplash and natural stone floor tiles installed in an offset pattern add an air of sophistication to this traditional kitchen design. We’ve also included a couple of money savers—inexpensive thermofoil cabinets and a ceiling fan to cut summer air conditioning bills. 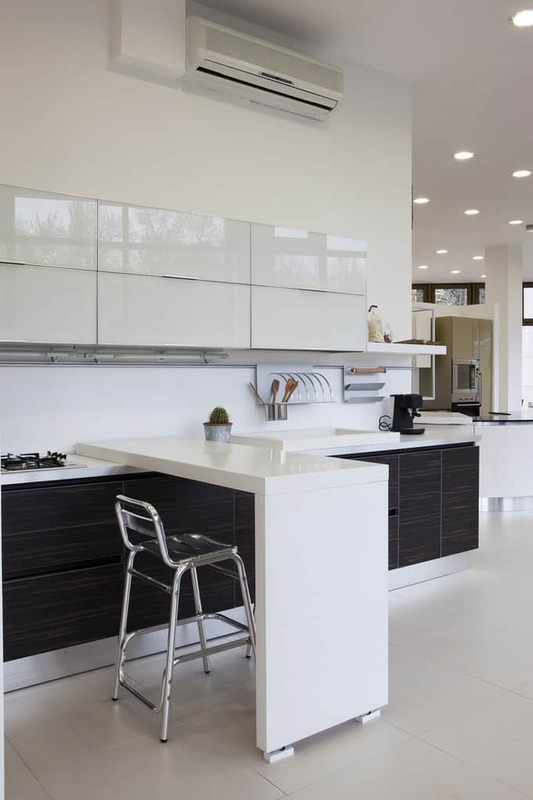 White kitchens are always popular no matter their style. Modern fan-backed chairs around the eat-in island are an intriguing contrast to the country-inspired buffet and hutch. This kitchen proves beyond a shadow of a doubt that there are no set rules in interior design. If you love something, use it. 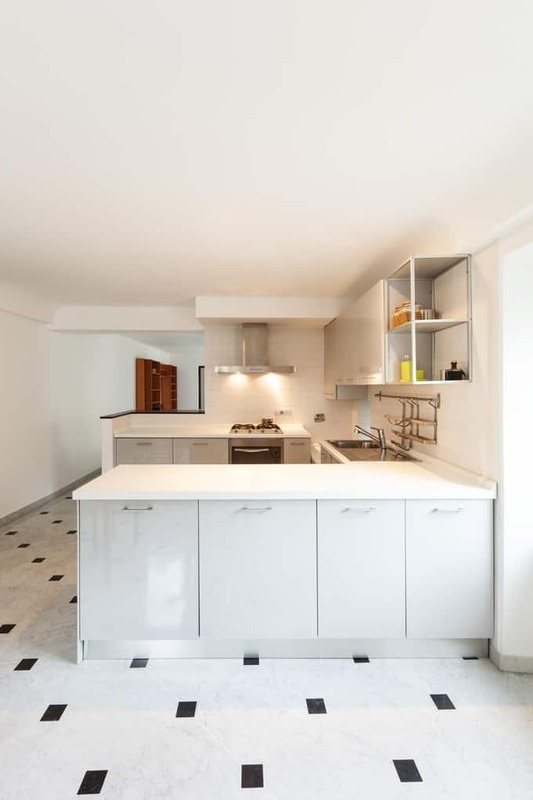 All of the storage and the functionality in this white kitchen are located on two walls. The dishwasher is off to the right of the integrated cooktop and the refrigerator and microwave are next to the wall oven. Frosted front European-style upper cabinets and a straight-run subway tile backsplash add a modern bent to a contemporary space. 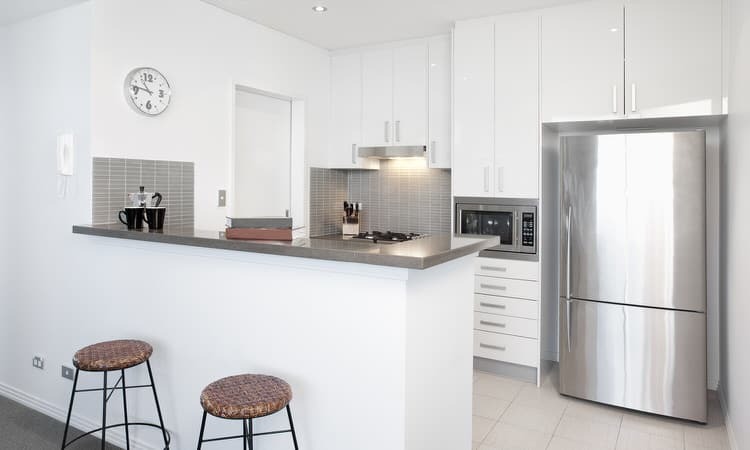 This yummy kitchen had its beginnings as a young couple designed their first home together. The husband needed a place to hone his gourmet cooking skills and the wife wanted a wine cellar. The kitchen had to be the focal point of their new home. Their wishlist also included a predominately white palette with dark accents and windows stretching length of the room. They both got exactly what they wanted. This kitchen was built for entertaining—with loads of storage, floor space to accommodate multiple cooks, an extra large fridge, lots of counter space for prep work, and plenty of task lighting. Originally the footprint contained a small kitchen and separate dining area. The two spaces were combined to create this incredible fully catering kitchen. A hip, white kitchen makes the best of cramped quarters in this midtown high rise. 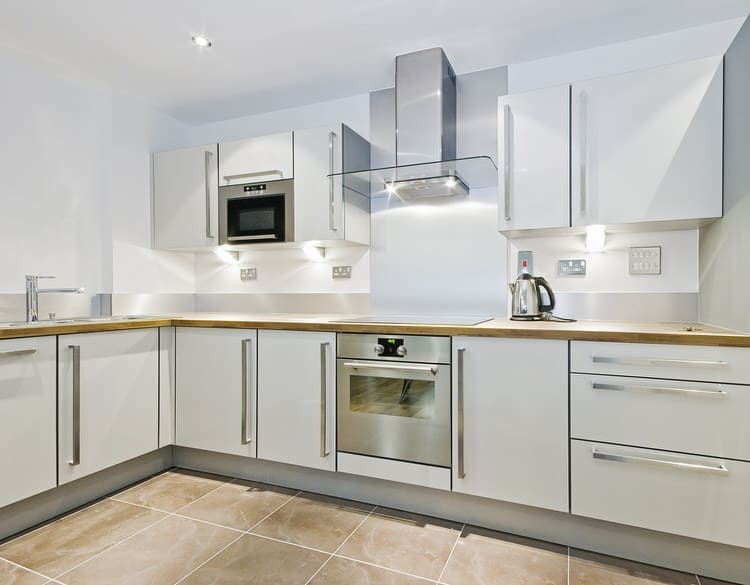 The talented kitchen designer managed to squeeze cooking, dining and multi-purpose areas into a very compact space. A window on the right visually opens up the room along with the see-through dining table. The inverted bowl chandelier and ultra-modern barstools are fitting touches for this urbane condo kitchen. 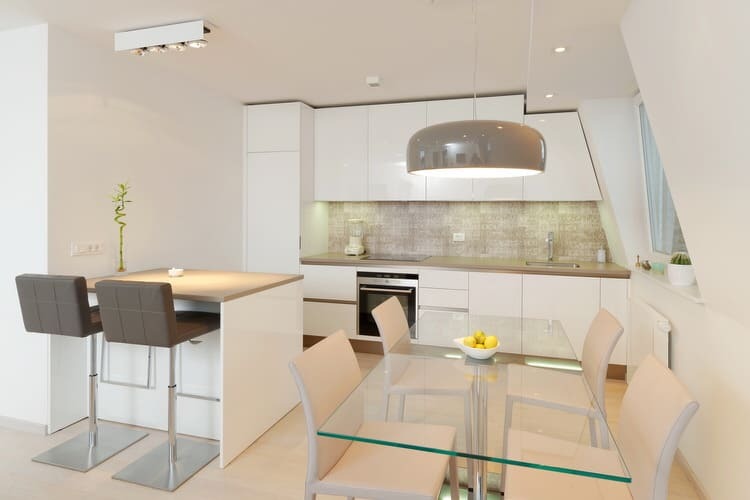 How do you make the most of a kitchenette in an open-concept loft-like space? Put in a 2-burner cooktop, an open shelf above, a full size sink, and an undercounter refrigerator. Our favorite design element is the smart looking work/dining table that glides along the counter between the cooktop and sink. A fantasy of white best describes this kitchen. Even the pot rack and appliances are white. 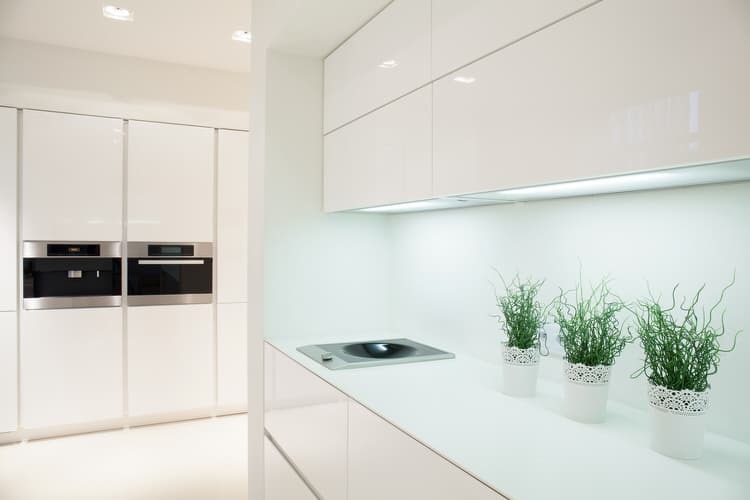 Appliance manufacturers are introducing lines with bright, white finishes as an alternative to stainless steel. Could it be the stainless trend is on the way out? All we know is white is a style that will endure for all time. The owners of this kitchen wanted a larger space, so they bumped out a wall and installed a long island with a range top. 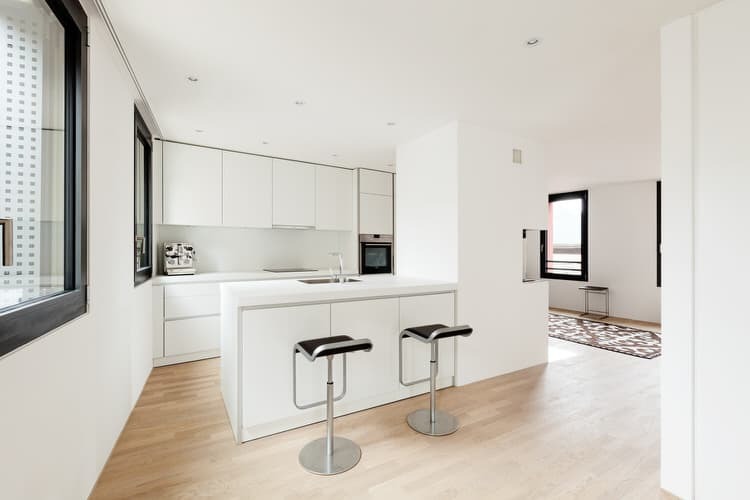 The use of white walls, cabinets and flooring make the space appear bigger and brighter. The charcoal granite is the stand out in the room. This studio apartment kitchen makes full use of the back wall. Integrated appliances and a building block track system allowed for free form cabinet arrangement from floor to ceiling. The scoop back chairs and hairpin dining table are the owner’s nod to mid century design. The flooring and lighting pendant are smart suggestions from their designer. White is appropriate for a sleek, modern visual that reads minimal. 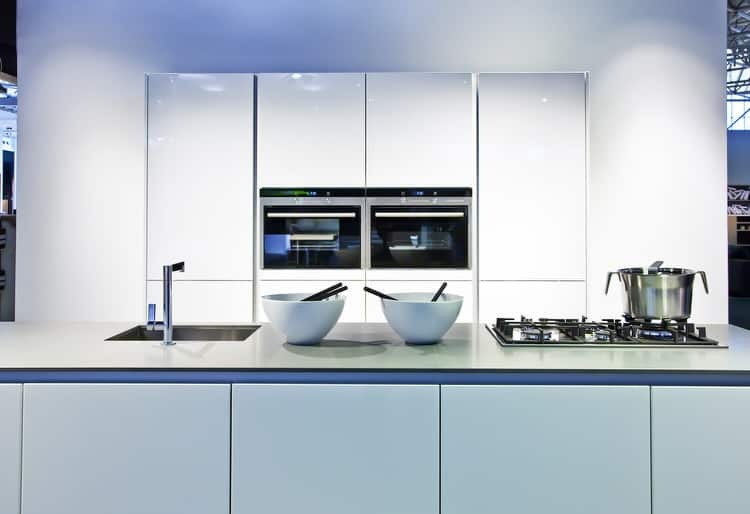 We love seeing glass and white lacquer in modern spaces because it works so well with linear hardware, stainless steel and polished nickel finishes. A stark, yet functional galley kitchen was designed especially for this converted commercial building. It may look spartan, but it contains all the essentials one would ever need to whip up and clean up after a gourmet meal. A black glass backsplash and a band running just below the countertops, accentuate the long, narrow space. 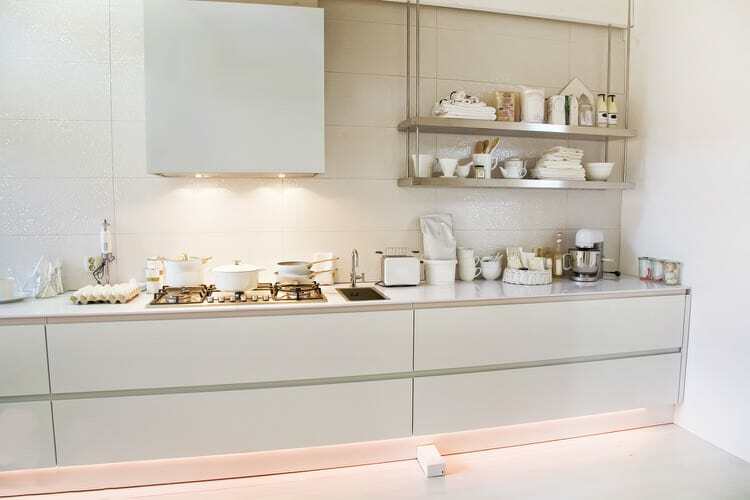 Play up the fact that you love your white kitchen by choosing white dinnerware and cookware, accessories and lighting. 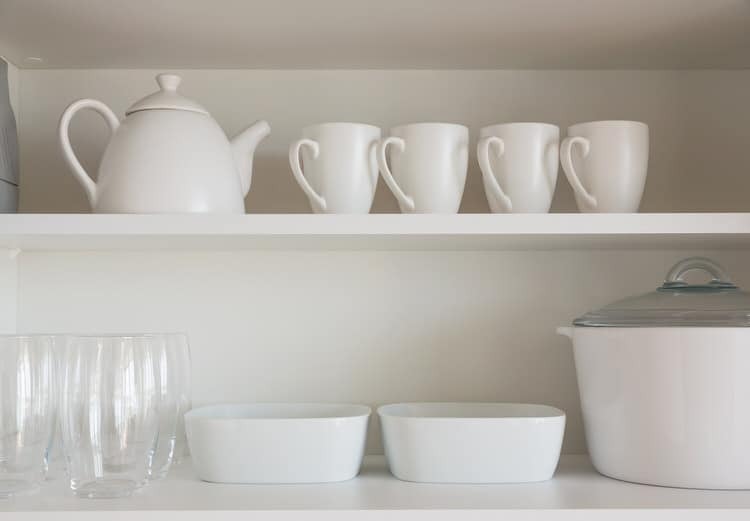 White accents will not only reinforce your single color design statement, they will also make shopping for decorative kitchen items easy peasy! 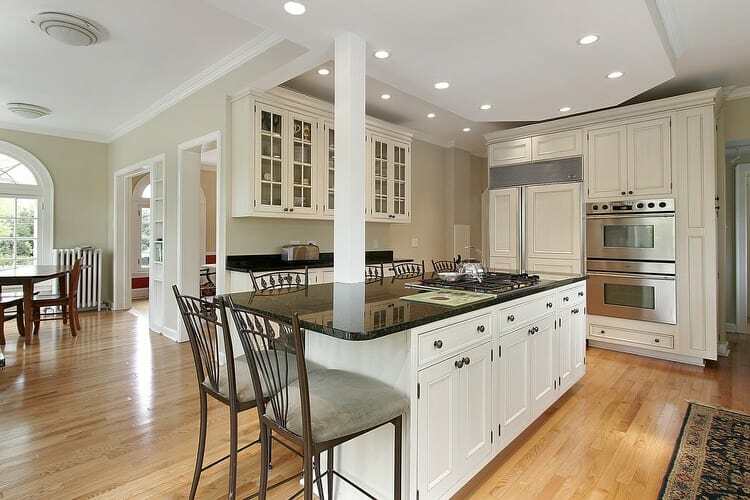 Simple, flat-panel white cabinets won’t distract from the golf course views from the country club villa’s kitchen. A transitional kitchen like this one draws upon the best of several styles to create a unique design personality. Our favorite is the contemporary, built-in office-style peninsula table. No need for a separate eating nook in this kitchen. Breakfast, lunch and dinner are served right here, front and center. Dark stone countertops set against bright white cabinets add some drama to the prep areas of this functional kitchen. The generous island allows for seating at one end, work space in the middle and a cooktop with downdraft ventilation on the opposite end. Recessed lighting and two stylish pendants grace the custom ceiling effect. 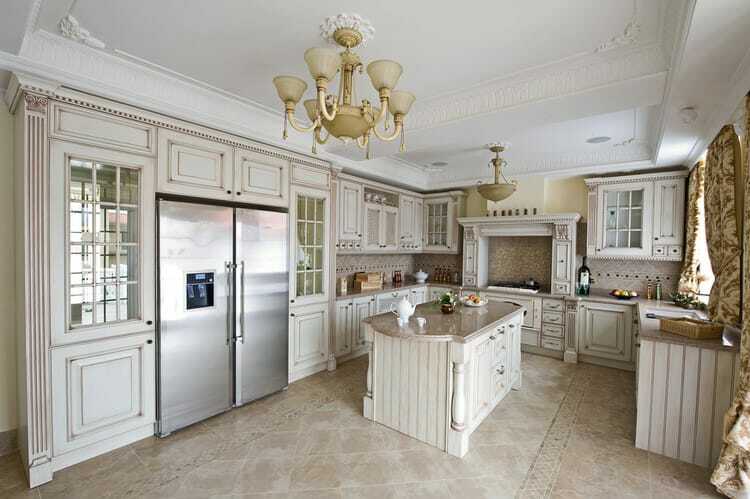 This formal kitchen features an elaborate French stucco vent hood flank by glass front display cabinets. Aged white cabinetry keep things light and bright under the glow of antique reproduction chandeliers. 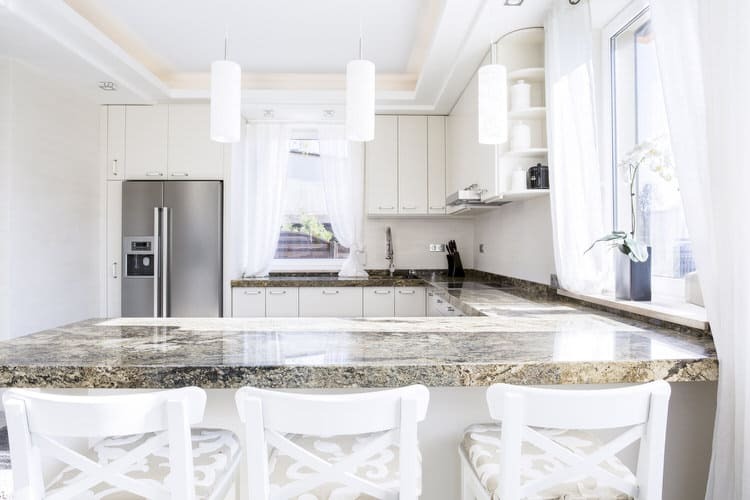 Creamy off-white granite adds to the Old World feel. 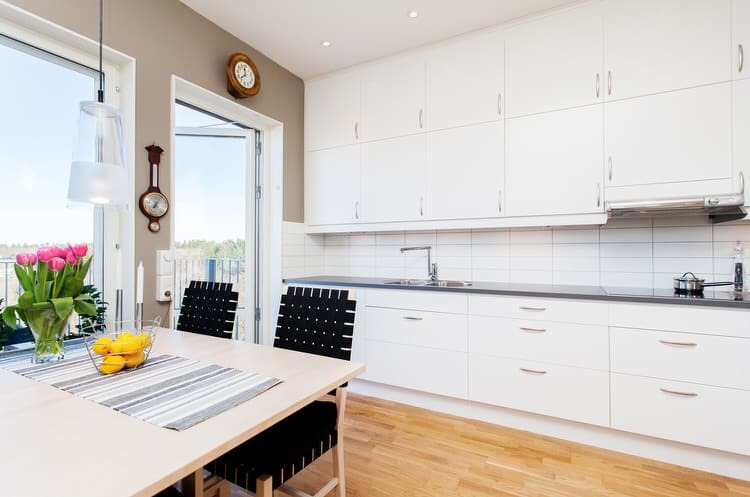 Simplicity is the key to this small and workable kitchen layout. Glamorous black granite counters are the perfect foil for basic white cabinets. Brushed nickel bin pulls and knobs along with stainless steel appliances give this kitchen just the right amount of sparkle. A large arched window in the breakfast nook lets the light pour into this space, making for great views while cooking and dining. 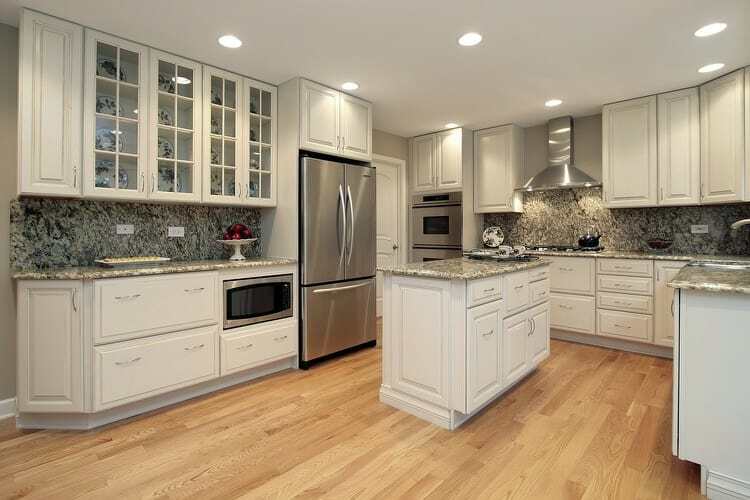 White Shaker cabinetry with glass fronts and a beadboard island are offset by polished soapstone and warm oak flooring. Alabaster walls and a bright white ceiling tie everything together. 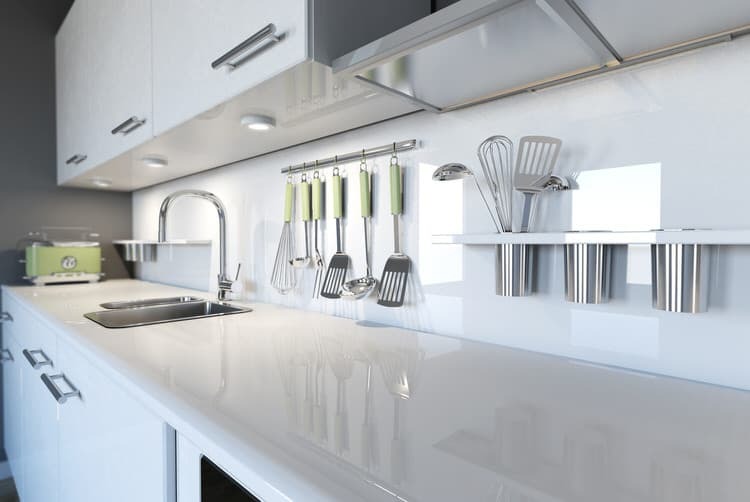 If you don’t have the budget for a major kitchen expansion, maximize the space you do have with a couple of smart design tricks. 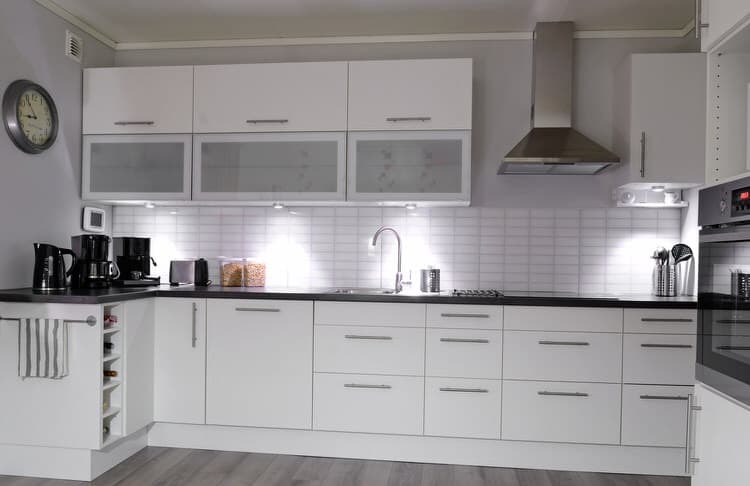 A wall of sleek white cabinets makes the room feel larger and gives you ample room for kitchen and miscellaneous household storage. Bring in a functional table to make this the perfect place to do homework or catch up on bill paying after a busy day at school or work. We really dig kitchen cabinetry that looks like furniture. Here, stately, off-white cabinets bring a decidedly elegant touch to this kitchen. Hints of antiquing glaze work with the hues in the light maple flooring. 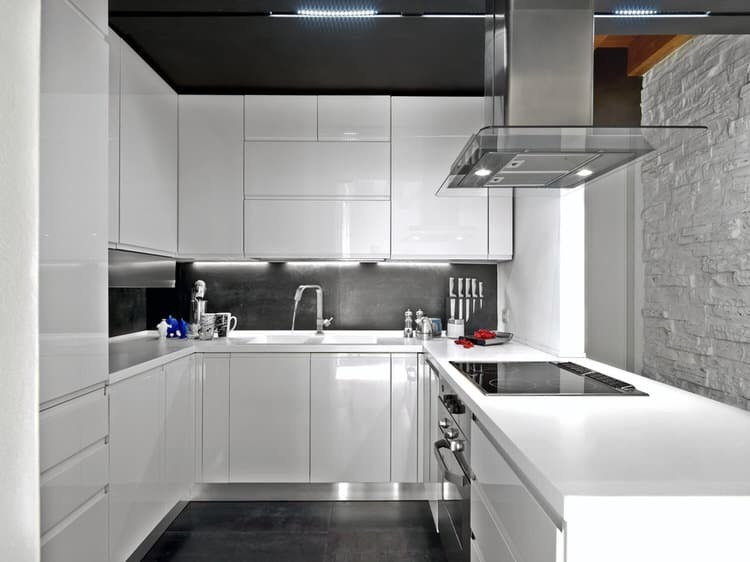 Cabinet hardware and countertops in a similar tone add to the soothing, monochromatic look. 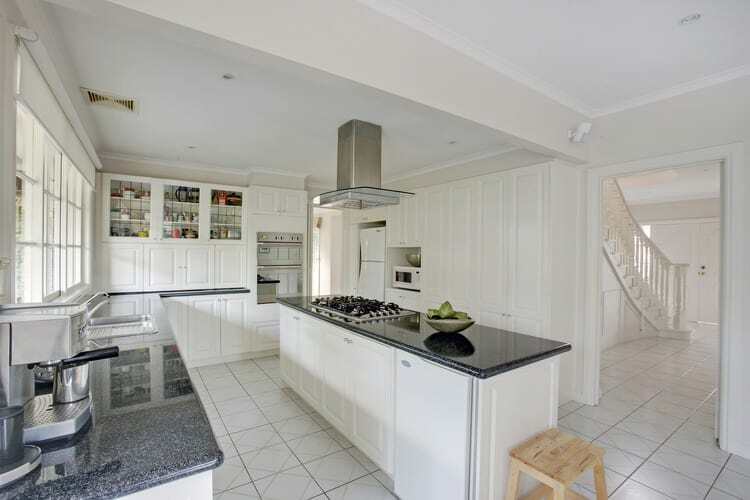 Snowy white, wall cabinets give this kitchen a clean and tidy appearance. Muted sage gray backsplash tiles echo the bold teal paint above the cabinets. These little dashes of color provide places for your eyes to rest as they take in this sea of white walls, floor and ceiling. The owners of this tiny house in the suburbs wanted a kitchen with personality plus. They are more apt to eat out or order in, so their needs were fairly simple: storage space and a place to prepare and cook the occasional dinner. They also wanted to incorporate eco-friendly materials into the design. 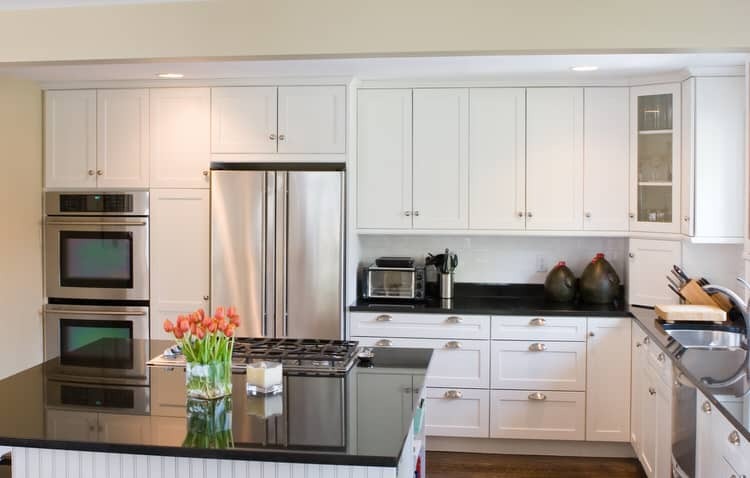 Bamboo counters and formaldehyde-free cabinets in cheerful white fit the bill for this environmentally-conscious couple. Sometimes you’re stuck with low ceilings in condo or apartment units. 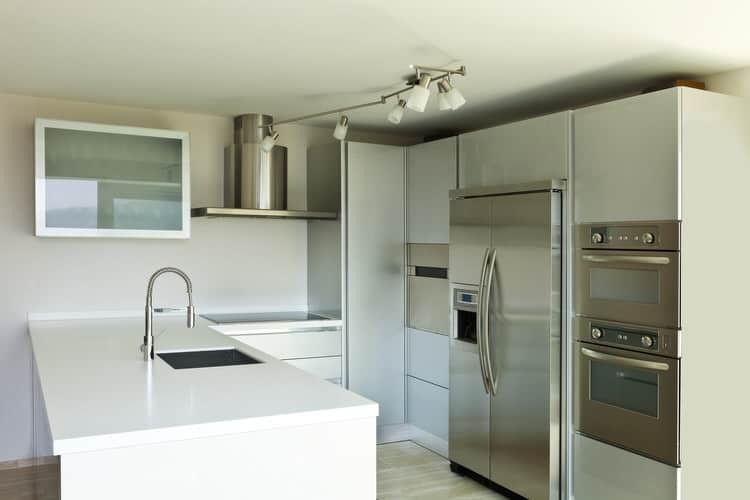 Make the best of a less than desirable situation by keeping the cabinetry bright and choosing reflective stainless steel appliances and glass front cabinets to deflect attention away from your height-challenged ceilings. 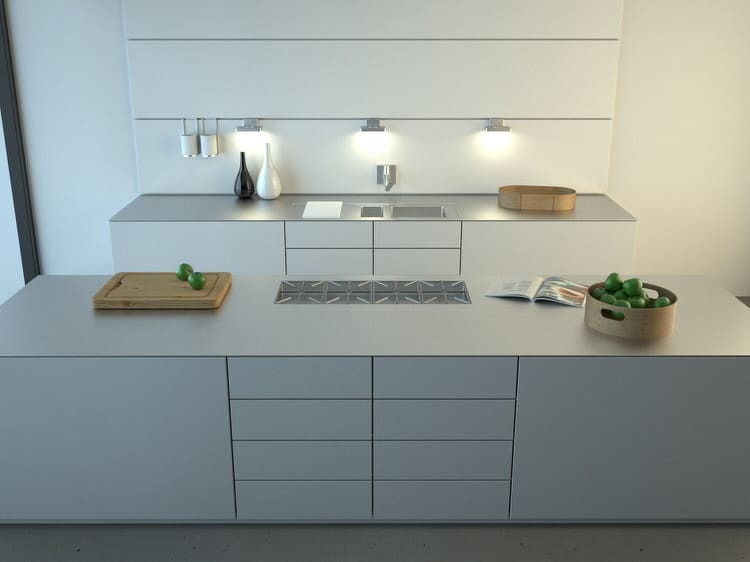 Modern stainless open shelving and stock cabinets provide this efficient kitchen with ample storage. A simple lighting package consists of overhead cans and a cool range vent with integrated task lights. The real surprise is the LED rope lighting concealed along the underside of the base cabinets. It offers soft illumination for a dramatic evening effect. A closed-in galley kitchen gets a reprieve with a partial take down of the offending wall, giving the space breathing room and a view to the main living area. Tasteful granite in a dark taupe, tawny gray ceramic tiles and industrial bar stools create a stylish contrast to the shiny white cabinets and the owners’ pride and joy—the massive refrigerator! The counter stools in this uptown loft kitchen get their inspiration from Bauhaus, but the rest of the room is totally mod. The integrated refrigerator blends right in with the lower cabinets. The double upper cabinet features frosted glass drawer fronts in pale aqua with a matching glass tile backsplash. The stainless and glass vent hood completes this ultra-modern space. 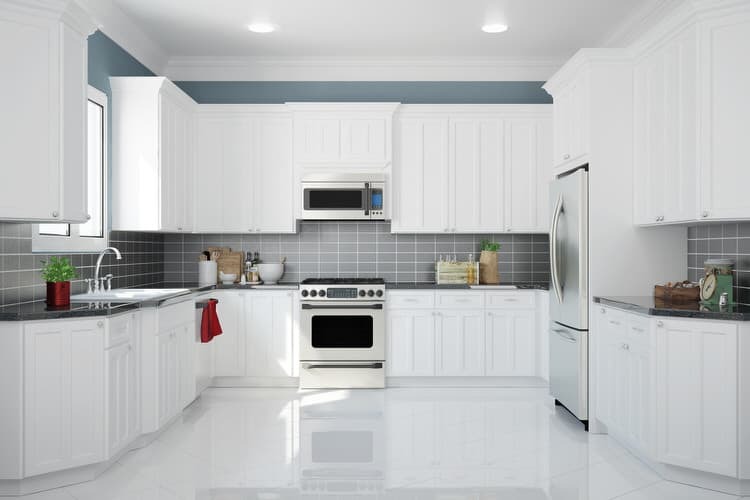 We love the look of a monochromatic room with varying shades of white represented in kitchen cabinets, trim, walls and flooring. 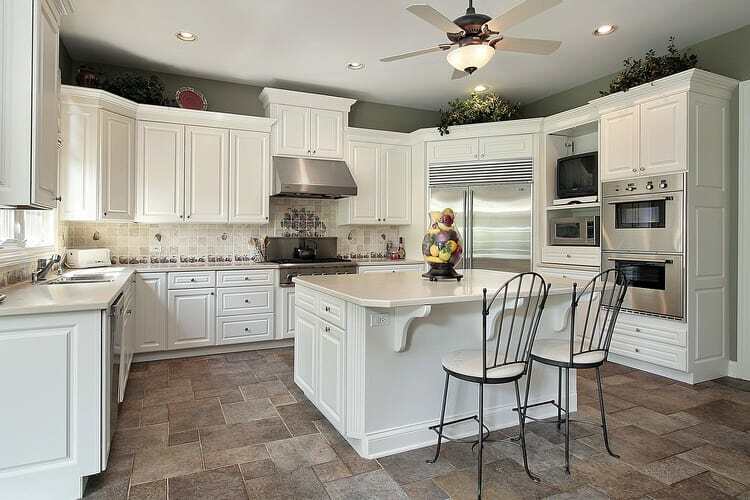 The bone quartz countertops and matching backsplash paint look beautiful with the bright white cabinets and overheads. Think about adding white curtains to add softness and texture to your kitchen. A white color scheme will allow you to introduce other colors over time without undergoing a major redesign. Most people would look at this mid century ranch kitchen and immediately remove the upper cabinets and open the kitchen up to the adjacent family room. These homeowners decided to maintain the integrity of its original design and color scheme. The original linoleum was replaced with blond maple flooring. The effect pays homage to the 1950’s, but functions just as well today. 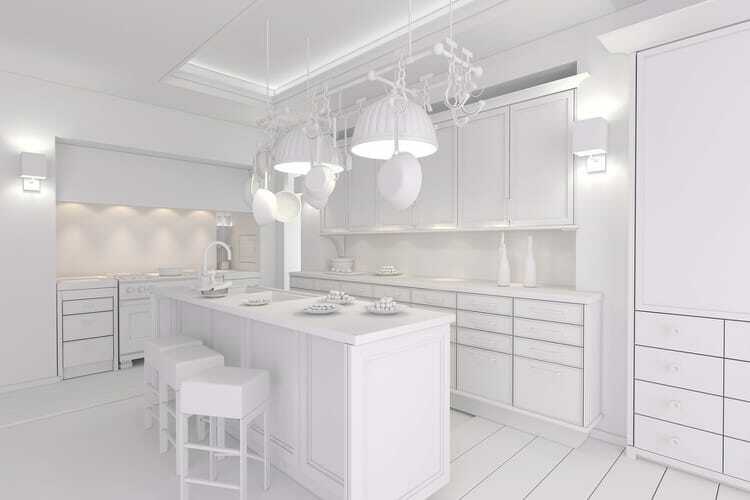 Dream a little dream with this loft kitchen all in white. This transitional space with its grand center table and slipcovered chairs invites you to come in and enjoy the light and views. 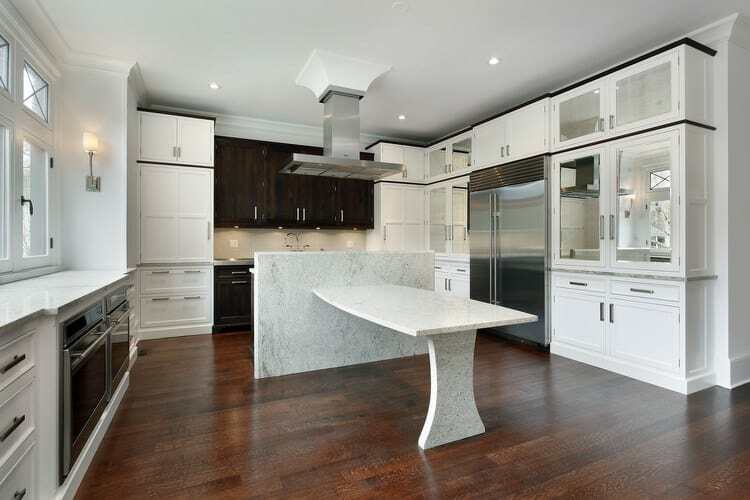 Carrara marble countertops and cabinets in matte white add to the ethereal quality. The delicate frosted pendants add a soft glow throughout the space. 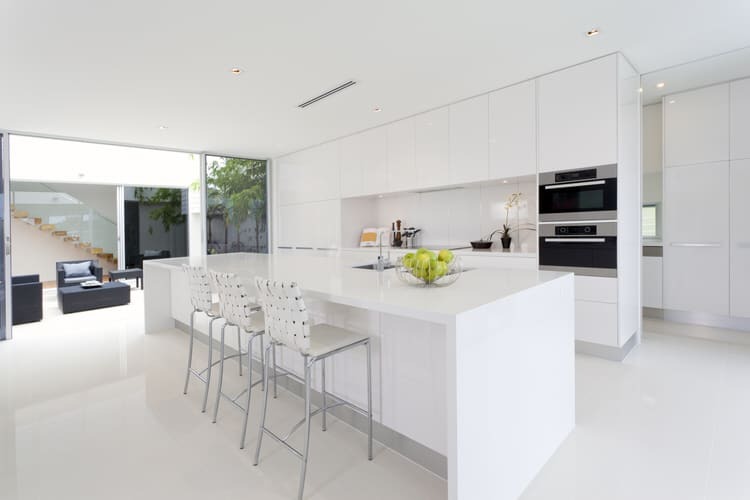 Gray concrete floors ground this ultra modern open-concept kitchen. 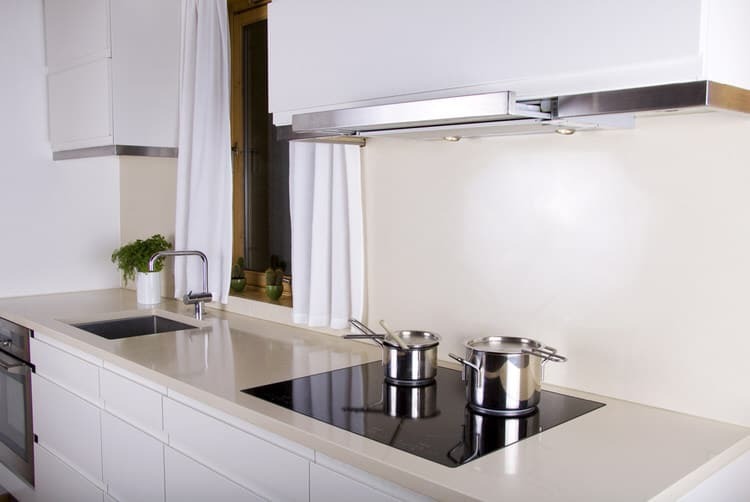 Work surfaces are illuminated by adjustable light fixtures that clip into the wall tracks. Other components can also be installed along the upper and lower tracks to provide additional storage. 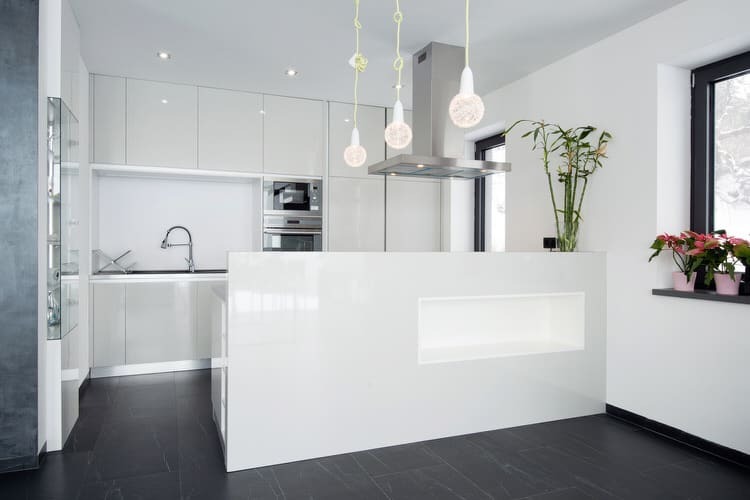 White lacquered kitchen cabinets make this loft kitchen look bright, shiny, fresh and modern. The double ovens centered within the cabinetry resemble a pair of eyes keeping watch over the proceedings. One thing you’ll need to watch out for is dirt and grime on those lovely cabinet doors. Wipe off any fingerprints and food residue immediately. Use cleaners recommended by the manufacturer to maintain that glossy finish for years to come. A whitewashed brick backsplash, divided glass front cabinets and a country style nickel faucet give this contemporary kitchen a bit of down home charm. Double windows over the sink make this Boston brownstone kitchen feel bigger than its limited square footage. 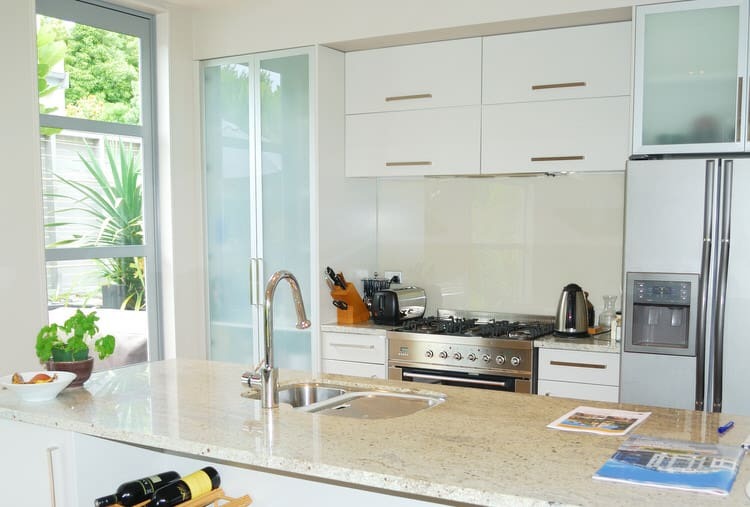 Top things off with a durable quartz counter and you have a hardworking, timeless kitchen. The coffered ceiling got us immediately. Then the cylindrical pendants caught our attention. The gorgeous granite work surfaces cinched the deal. It just makes us want to step up to the breakfast bar, take a seat on one of the white crossback counter stools, order a cappuccino, and linger awhile.